It’s 8:30am, and our preschool students are joyfully climbing the stairs, past a view of clouds and sounds of chirping birds (all part of the multi-media experience at Bubbles Academy), up to their Tree House classroom. 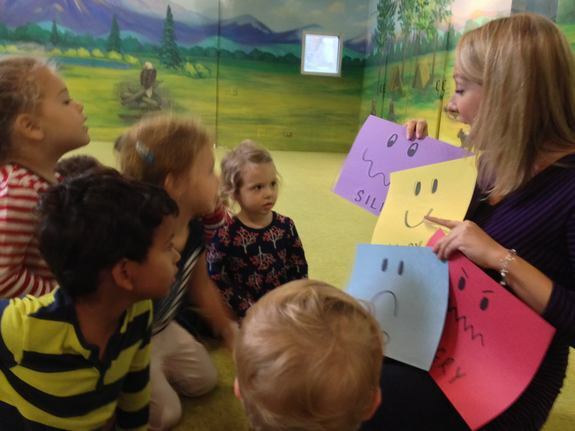 There, under the facilitation of caring teachers, they engage in child-directed play, circle time songs, stories and activities as a group before dividing to explore learning centers around the room. They enjoy fast-paced gross motor play during recess in the Mountain Room and share discussion time together while eating a healthy snack. All of these joyful moments are a familiar sight in quality preschool classrooms around the country. An Arts-Integrated philosophy seamlessly combines content and skills from the arts (dance, music, theatre and visual arts) with core, developmentally appropriate, early-childhood learning standards and socio-emotional skills. This philosophy fosters a vibrant learning environment where life skills emerge from a multitude of perspectives, reaching the breadth of needs co-existing in one classroom. Children learn from teaching artists, who apply their talents in visual art, theatrical performance, music composition and improvisation in the classroom – in addition to their early childhood education expertise. The teaching artists’ diverse, creative backgrounds and approach to the world gives them unique perspective and ability to engage students in active, imaginative play and open-ended learning opportunities. An Arts-Integrated classroom is whimsical and engaging. For example, students studying the migration of birds learn by designing and building their own wings. They dance through flight patterns and act out stories from a bird’s perspective. The teaching artist – playing the role of a bird – asks students for help finding warmth in the winter. The students, in turn, actively discover and grow. They use an array of materials, mixing and measuring, responding to rhythm and music, and improvising while they express emotions and develop empathy, learning to think and communicate from a bird’s perspective. Arts-Integrated education helps children feel completely at home in a space designed for play and learning. However, the everyday whimsy of Arts-Integration is grounded in science and thoughtful, authentic assessment of skills and milestones. How do you encourage your little ones to see the art in everyday life? Comment below to share!